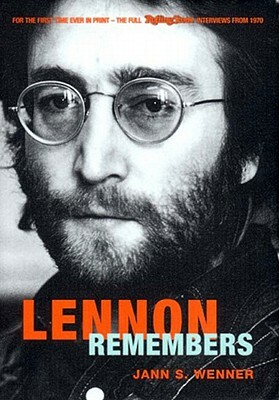 Published on the twentieth anniversary of his death, this candid book reveals new information on the breakup of the Beatles, fellow musicians such as Bob Dylan and the Rolling Stones, Lennon’s attitudes towards revolution and drugs, and his relationship with Yoko Ono. Featuring new introductions by Ono and Wenner, and containing substantial material never before seen in print, Lennon Remembers presents a compelling portrait of a complex musical genius at the height of his career. Sometimes anguished and angry, often tender and poignant, these interviews are indispensable to understanding who John Lennon was and why his legacy continues to resonate today. “Lennon Remembers is classic Lennon. It’s not a sit-back-and-put- your-feet-up read ... it’s like a jolt on your nerves like bad, bad espresso. People with weak stomachs should close the window before reading. You might just feel like jumping out.”—Yoko Ono, from the Foreword.